Catching some zzz's with his gun in hand this pirate in the hammock is a great talking point for your pirate scene. Here is a pirate lying down in his hammock. Create the perfect pirate scene by hanging this up from the ceiling. 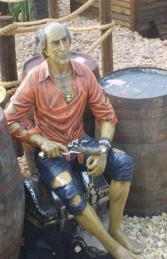 Lazing around with his gun in his hand, this realistic pirate model looks great as a stand alone piece but combines well with any of the other models and props. Before placing your order if you have any queries or special requirements do contacts us, and we will be happy to discuss these with you by phone or email.